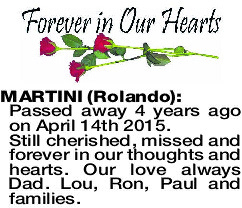 MARTINI ROLANDO Passed away 4 years ago on April 14th 2015. Still cherished, missed and forever in our thoughts and hearts. Our love always Dad. Lou, Ron, Paul and families.